In Mantalongon, Dalaguete (pronounced “Dalaget”), standing at 1,013m above sea level, is Osmeña Peak — the highest mountain in Cebu. Named after the native Osmeña clan — one of the oldest and most established political dynasties in the Philippines — the peak is one of many craggy hills that make up the Mantalongon mountain range. This group of mostly unnamed peaks stretches as far as the municipality of Badian, and is considered a twin to Bohol’s Chocolate Hills. There are two hiking trails that begin in Badian, passing by Kawasan Falls, and another one in the town of Dumajug, which commences in Brgy Liong. The easiest and most popular trail, however, is in Dalaguete. While the other three require a multi-day hike, the Dalaguete trail can be covered in half a day. Hikers can start trekking from the Mantalongon Public Market — from here, it’s a two-hour trek to reach the summit. Alternatively, you can ride a habal-habal motorbike straight to the registration area, which is only 15 to 30 minutes from the peak. Hikers are charged a PHP20 registration/environmental fee. A good portion of the Dalaguete trail winds around a small hill with gentle inclines, and through small private farms and even fields of grazing livestock. 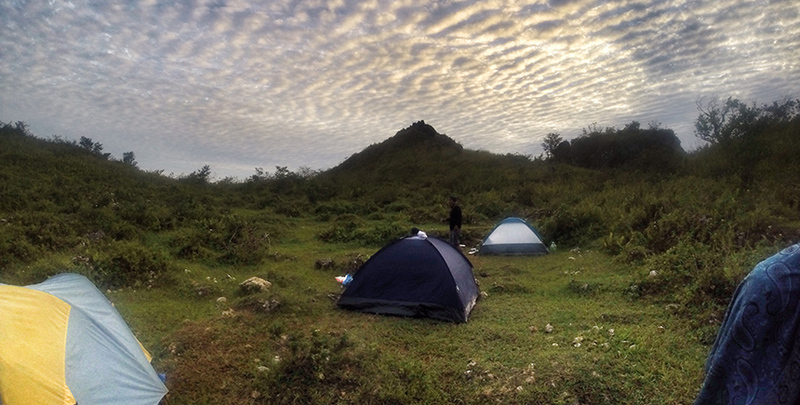 It then opens up into a wide, flat ground that is Osmeña Peak’s camp site. There are no trees along the trail, only grasslands. All three trails are open all year round, but hikers are advised to visit during the summer months, as the trails can get muddy and slippery. 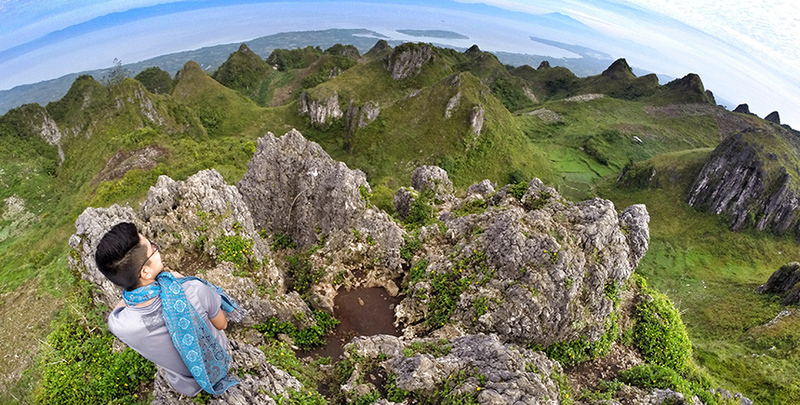 From the top of Osmeña Peak, you’ll get to enjoy unobstructed views of the rest of the Mantalongon range — an expanse of jagged, moss-green hills straight out of a fantasy novel. 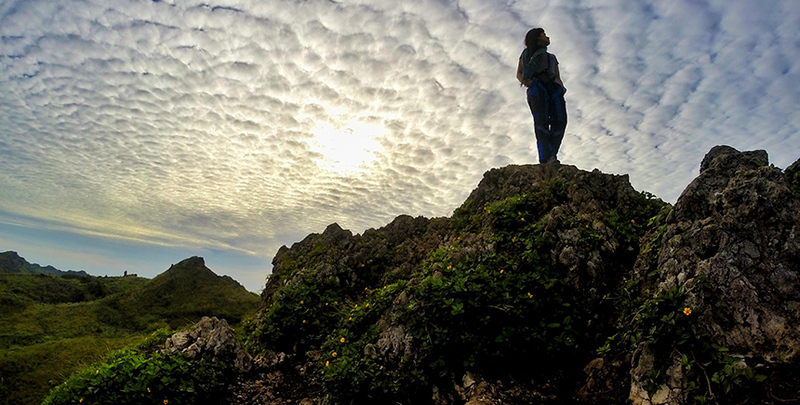 As the highest point on Cebu, the peak is also the perfect place for stargazing. On a clear night, the sky is mottled with stars, with the swirling Milky Way visible just before dawn. If you’re lucky, you might also be greeted by a sea of fluffy cirrocumulus clouds in the morning. Don comfortable and lightweight clothes, while opting for pants and long-sleeved shirts to protect yourself from insect bites. Wear closed, non-slip shoes, and don’t forget to slap on the sunscreen. Bring at least two liters of water, snacks such as fruits and nuts, and tuck a couple of garbage bags in your backpack — take your trash (and that of others) down with you. If you’re camping overnight, bring a tent or a tarp. Hammocks aren’t advisable, as there are no trees in the area. Bring your sleeping bag, too, as it tends to get chilly at night. Bonfires are discouraged, so bring portable stoves if you plan to do some cooking. Don’t forget to double your water supply, too. Lastly, bring extra batteries for your flashlights — it gets really dark up there! Do note that mobile reception is intermittent on the peak, but ensure that your phones and cameras are fully charged for your photo-taking needs. Board a bus bound for Oslob or Bato (PHP100-110 for a one-way trip) from the South Bus Terminal in Cebu City. Alight at the Dalaguete junction. Here, you’ll find habal-habal that can take you to the base of the mountain and back to the junction for PHP200. Be sure to get your driver’s number and arrange a pick-up time for your return if you plan to stay overnight — no commuter vehicles ply the area, so you don’t want to be left stranded.